The joint gas and water company was established in 1866, and operated from this building from 1883 until the early 1930s, when its functions were taken over by the Urban District Council, and the Shanklin Gas Company. 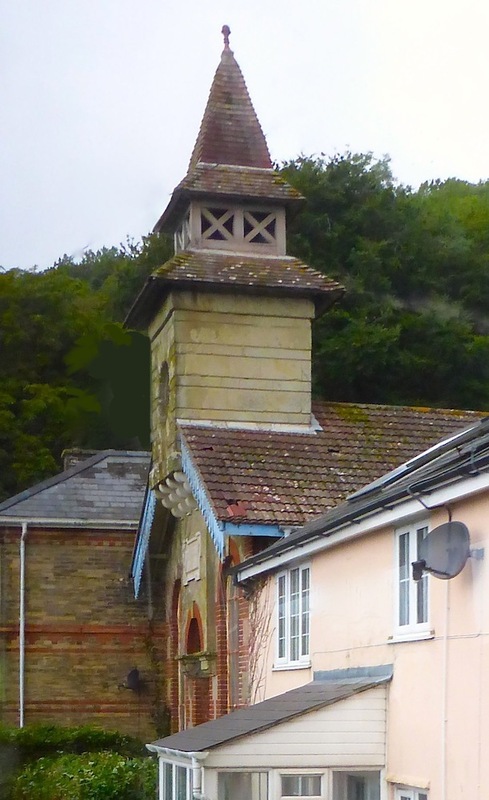 It looks like a church or a village school: "small and elaborate, with two-tiered turret ending in a spirelet," it has "fretted bargeboards, round-headed windows, and red brick dressings to rubble walls" (Lloyd and Pevsner 290). Beyond it are the former electricity works of c.1898, also small and with decorative touches, which provided the first public electricity on the island. These industrial buildings look rather quaint now. "Electricity Supplies on the Isle of Wight." Wightpedia. Web 5 November 2017. "Ventnor Gas and Water Co. Pumping Station." Wightpedia. Web 5 November 2017.